Students vote in an educational parallel election organized by the Student Vote organization. 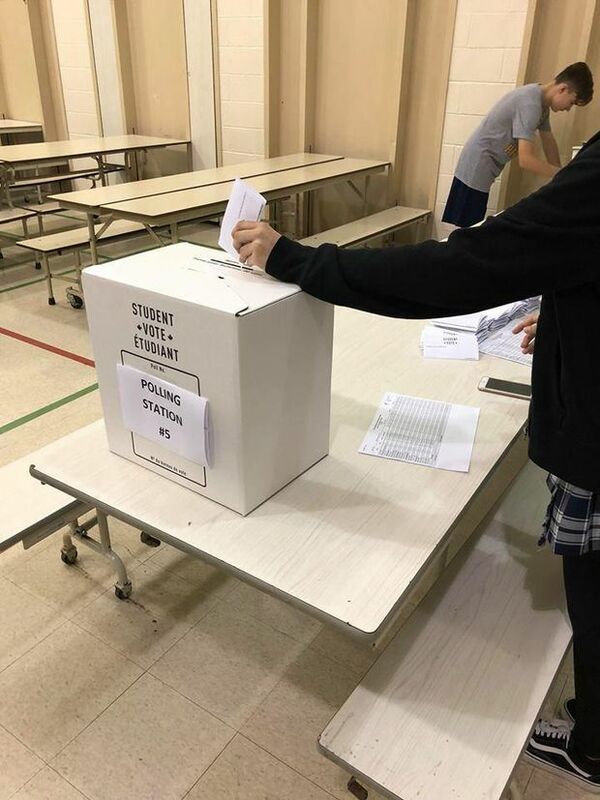 While they may not be able to vote in today’s provincial election, Ontario students participating in a parallel election through the Student Vote program might be more prepared than some actual voters. “This is the fun part of the election. It’s when we see pictures of kids voting, and we hear from teachers,” says Lindsay Mazzucco, who co-founded Student Vote with her husband Taylor Gunn. 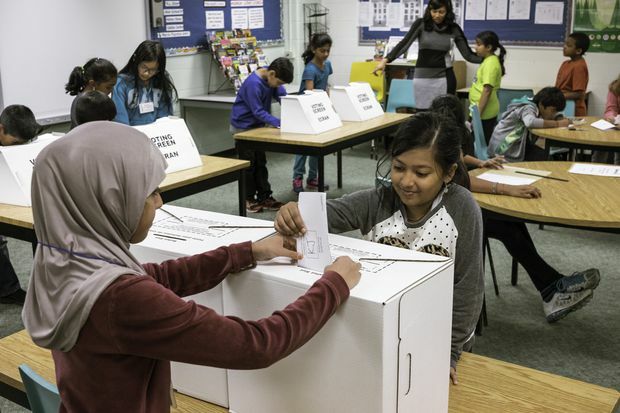 From May 31 to the day before the Ontario election, students and their schools took on the roles of election officials to organize their own simulated provincial election. They invited local candidates and attended sessions on how elections and parliamentary democracies work. On election night, each participating school’s ballots are counted and shared with media for broadcast and publication. “We had a note from one Toronto teacher, who ran Student Vote for his Grade 10 students and has a son in Grade 5. His son got to be a returning officer for Student Vote,” Ms. Mazzucco said. Started in 2002 by Ms. Mazzucco and Mr. Gunn, Student Vote has since been merged into a larger civics education organization called Civix, where the couple still serve as executives. Ms. Mazzucco is chief operating officer and Mr. Gunn is president and chief election officer. Participation figures for this Ontario election aren’t in yet, but in the last federal election in 2015, nearly 374,000 students from 2,783 high schools across Ontario took part in Student Vote, a 60-per-cent participation rate among the schools enrolled in the program. A polling station at the parallel election through Student Vote at East York Collegiate. Elections Canada evaluated the program, which is run in federal, provincial and territorial elections across the country. It found that 96 per cent of teachers found it helpful, 90 per cent of parents said their families benefitted and students said it boosted their intention to vote in real elections once they turn 18. Getting young people engaged is a long haul, though. Turnout in the last Ontario election four years ago was just 51 per cent. In that election only 34 per cent of those between 18 and 24 surveyed by the polling firm Campaign Research said they bothered to vote. “We distribute materials to the participating schools — activity guides, resources, posters, an election manual to take them through the process,” she says. It’s not just the students who benefit from the education, says Christina Ganev, a teacher at Toronto’s East York Collegiate Institute who has run Student Vote programs for many years. “One of my students in this election campaign says he went home and his father, a taxi driver, said he didn’t have time to find out about the issues and wasn’t going to vote. He went home and explained what he learned about the issues and the process and now his father is going to vote,” Ms. Ganev says. Ms. Ganev, a history teacher, thinks that one of the challenges in boosting young voter turnout is that there is a gap in the curriculum, in Ontario at least. 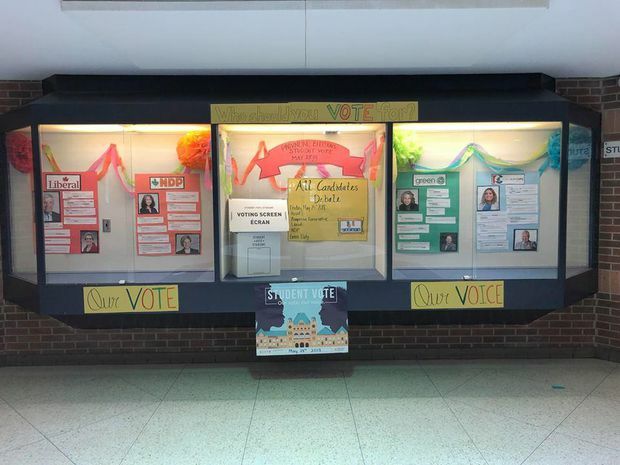 East York Collegiate's information display on the Ontario election through Student Vote. “In Grade 10 we have a formal civics course where we learn about the system, and then there’s no mandatory Canadian history course after that for the rest of high school,” she says. Filling this gap is why the not-for-profit, non-partisan Student Vote program is important, Ms. Ganev believes. The students get to meet actual politicians. East York had an all-candidates’ meeting, and another teacher, Ben Freeman, said his students at Toronto District Christian High School in Woodbridge got a thrill when a student involved in the school voting project discovered that PC Leader Doug Ford and his retinue pulled up in their campaign bus across the street. Setting aside any partisan preferences, class was suspended so the students could meet some real politicians — Mr. Ford and his former leadership challengers Christine Elliott and Caroline Mulroney. Students have a keen eye for the issues, too, Ms. Ganev says. 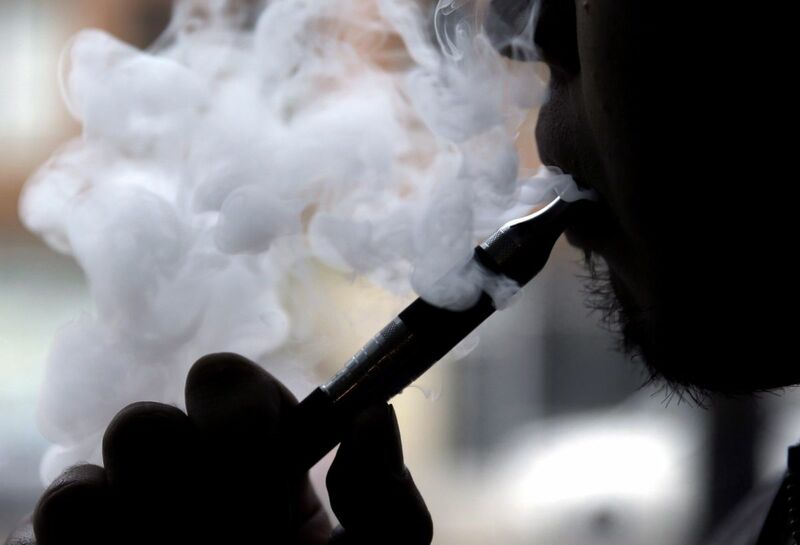 “They talk about standardized testing, changes to the marijuana laws, crime,” she says.